Many people suffer from Seasonal Affective Disorder (S.A.D.) in the fall and winter months. The lack of sunshine, combined with the cold, damp weather, make getting out into fresh air and nature more difficult at this time of the year. 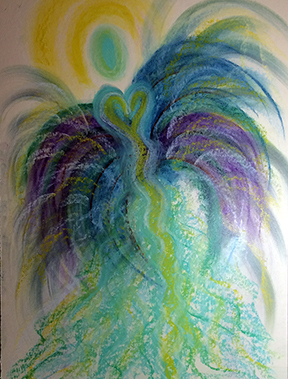 It is with this in mind that I’ve created this Bird of Paradise Angel to help alleviate those nasty symptoms of depression, lack luster energy and feelings of general lethargy and moodiness. 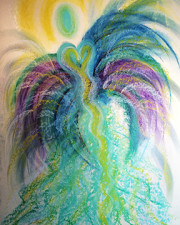 The Bird of Paradise flower symbolizes joyfulness. It also symbolizes magnificence. It can also be used to indicate exciting and wonderful anticipation. The unusually beautiful shape and brilliant colors of Birds of Paradise have made these flowers not just a designer’s favorite, but also a popular symbol of paradise. 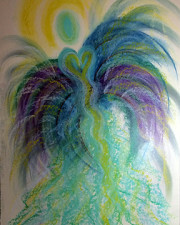 The Bird of Paradise Angel tells us to, “Stay open to new possibilities and seek your freedom wherever you can find it. Explore the world with a sense of optimism and excitement. Consider the what ifs … What if I felt better today? What if the sun were shining in my heart? And see what your answers are. They may just surprise you.” Let the colors of this brilliant angel brighten your spirit, lighten your heart, and elevate your mood. 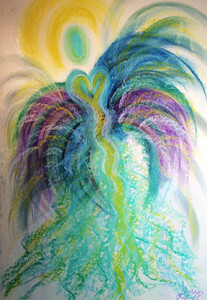 This beautiful angelic art print, was created by Visionary Artist and Angel Communicator, Lori Daniel Falk, with Pastel chalk, mineral pigments on paper.